This summer has been a scorcher so we’ve been cooking outdoors as much as possible. Unfortunately, our Umbria farmhouse does not have air conditioning, so my kitchen can get really warm if I have the oven on for any length of time. When we fire up the grill to cook our meat or seafood main course, I always add a vegetable side dish that can be grilled as well to keep things simple. These grilled zucchini wedges couldn’t be any simpler, and the addition of fresh mint really adds a bright freshness to the dish. I’m not sure why zucchini and mint go so well together, but I combine the two often, which takes a boring zucchini side dish to new levels. The water and fiber in this versatile vegetable help you manage your weight by providing low-calorie volume. Olive oil is a heart healthy unsaturated fat. 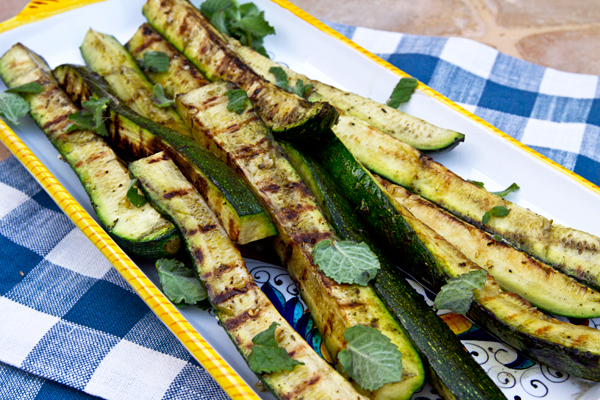 Grilled zucchini wedges with fresh mint is a great summer side dish for any grilled meat or seafood entree. Cut the zucchini lengthwise into four wedges. Mix the olive oil, salt, pepper, oregano, garlic, and chili flakes in a bowl than add the zucchini wedges and toss to coat. 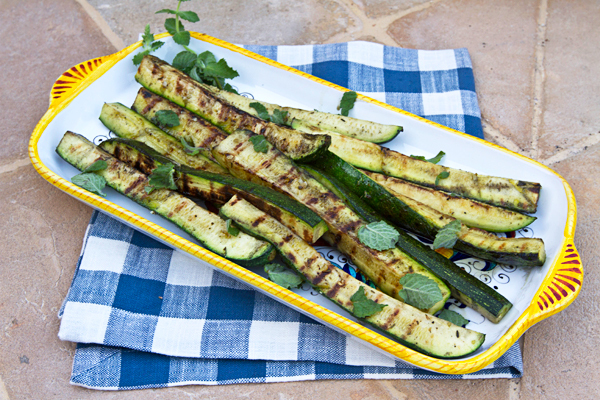 Heat up the grill and once the coals are ready cook the zucchini turning every so often until fork tender. Arrange the zucchini in a platter and scatter the fresh mint on top.